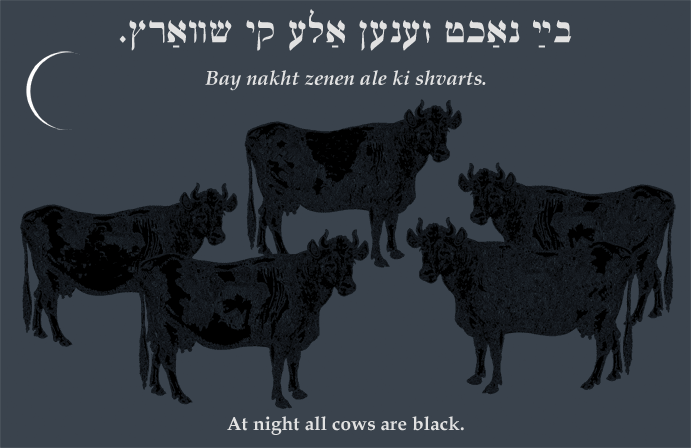 Yiddish Proverb: At night all cows are black. בײַ נאַכט זענען אַלע קי שוואַרץ. Bay nakht zenen ale ki shvarts. At night all cows are black. A sexually suggestive remark about marrying or sleeping with a homely woman: in the dark all women look alike, or in bed appearances don't matter. SOURCE: Bernstein, Jüdische Sprichwörter und Redensarten. Compare the English adage, "When the candles are out, all women are fair." Variations: "cows" may be replaced by "cats" (kets|קעץ) or "sheep" (shof|שאָף), or by "oxen" (oksn|אָקסן) if the reference is to men.